Ado-Ekiti – Ekiti State Government has introduced electronic receipt (e-receipt) as part of reforms in the collection of taxes and revenue generation. The state Deputy Governor, Chief Bisi Egbeyemi, said the use of e-receipt would block loopholes through which the state revenue finds its way into private pockets. Egbeyemi said that with the introduction of e-receipt, no revenue officer in the state was permitted to take cash from members of the public He explained that Ministries, Departments and Agencies (MDAs) have been directed to stop using manual receipts and key into the new e-receipt regime consequent upon the introduction of the Treasury Single Account (TSA). The deputy governor warned people of the state against patronizing middlemen or touts to pay money into any government account. He added that the government had also introduced the Direct Bank Lodgment System (DBLS) which would assist in blocking leakages and boost IGR of the State. According to him, the state government has hired consultants that will be working round the clock to ensure that no revenue will be lost. Egbeyemi explained that with the engagement of consultants, the state now has two operational electronic platforms which are the Auto-reg and e-receipt centre. 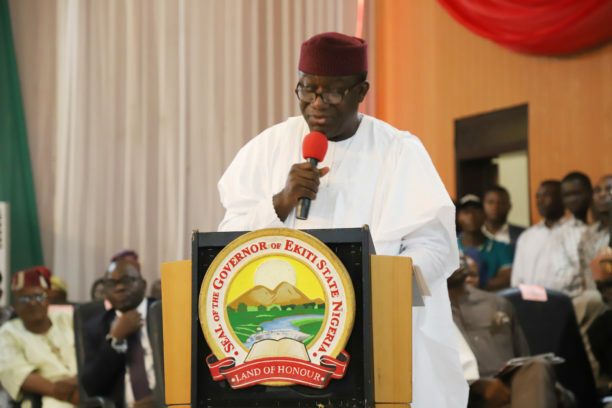 He stated that Gov Kayode Fayemi’s administration was more determined to boost the state’s Internally Generated Revenue (IGR) to reduce dependence on federal allocations. “We know the importance of taxation, it assists the government to perform its responsibilities and we urge our people to always pay their taxes. “Regular payment of taxes will boost our IGR and we want our people to be committed to payment of taxes for Ekiti to depend less on allocations coming from the Federal Government,” Egbeyemi said in a statement. Earlier, Ede said that CITN, in Ekiti for its joint district society meeting, assists in providing manpower need and professionals in the nation’s tax system. The CITN boss, who advocated autonomy for the states’ Internal Revenue Services (IRS), said revenue could be increased through pragmatic reforms of the tax system. He also used the forum to request for allocation of land to build the state secretariat of the institute.